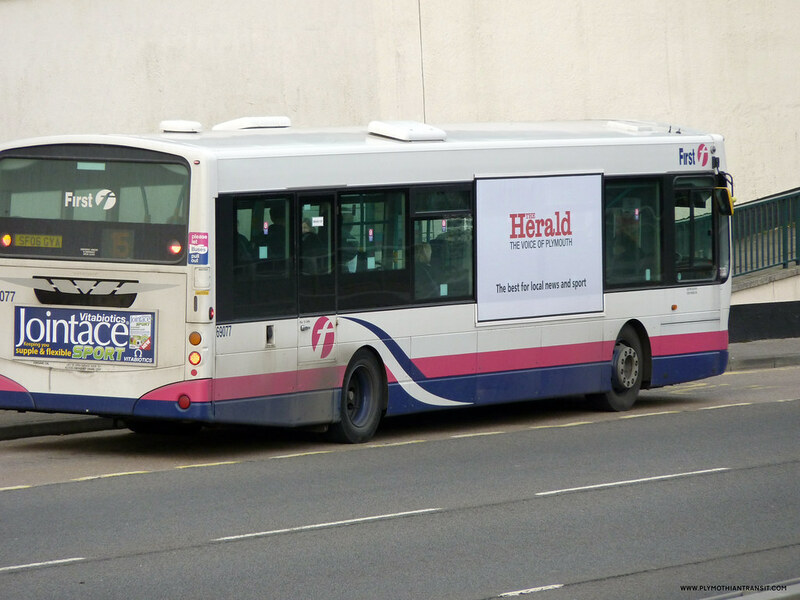 First get smarter with their advert buses? I have never been a fan of buses with large advert wraps plastered all over their windows as it can make for a miserable experience for the passengers inside, especially on wet days where it can become all but impossible to see out through them. When I first saw this example, and I think there is more than one, it struck me as a slightly better compromise in that at least it left most windows free. It was only when I had a closer look at the photo that I realised how smart First have been. It actually looks like there is some sort of frame around the advert, rather than just being stuck over the windows. This makes it tidier and I guess easier to apply to the bus. I have been a passenger on this bus, and at first I didn't even notice the advert which I guess is an improvement. Maybe if I was sat on the seats right next to it I may have done, but back in my normal seats the bus seemed just as bright and airy as these buses normally do. Plymouth Local History: Obliske - fascinating stuff! Ohh no! What this had done has actually remind me that I never posted the picture I took on Saturday or this advert bus! And now you've beaten me to it!